There is so much to see and do in Yorkshire. Centuries of history can be witnessed in the formidable abbeys and ancient towns while the scenery is as striking as it is varied. The county is also a frequent visitor to our homes through the many popular TV programmes that are filmed on location here. Tuesday 21st: After a leisurely breakfast, we drive to Thirsk where we visit the World of James Herriot. Peter Wright from the Channel 5 series The Yorkshire Vet, was trained here. After an educating visit, we have free time for lunch in Thirsk before we continue on a scenic tour of the North Yorkshire Moors. Wednesday 22nd: This morning we travel to Hawes where we enjoy a ‘Wensleydale Cheese Experience’. We learn about the history of the cheese and watch it being made before we savour the finished product in the cheese shop. This afternoon we continue to the Black Sheep Brewery where we have a tour and tasting. Thursday 23rd: Today we travel into York where we will have a free day to explore the many wonders this city has to offer. 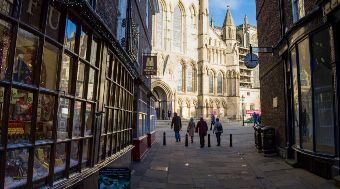 See exquisite architecture, stroll through quaint cobbled streets, visit iconic York Minster or simply watch the world go by whilst sipping a drink by the river. Nestled in the heart of North Yorkshire, Best Western Burn Hall Hotel offers the best of both worlds. It’s secluded enough to offer tranquillity and relaxation yet close enough to the county’s must-visit towns, villages and cities.